What a great turnout at the meeting last week! Weather was awful and it was still easily one of the most packed meetings we’ve had in quite a while. Thanks to all who came out and made it a great meeting and also thank you to so many of you that paid your dues! Lastly, but not least, thank you to Shawn for his presentation on sours and of course to J&M for hosting. Marin County Fair 2017 – We are running this again in 2017. We’ll need stewards, judges, sorters, etc. Please plan on volunteering if you can. There may also be a label competition as well, this is being headed up by Eric so reach out to him if you’d like to help. If you help on the county days you will get tickets to the fair as a thank you. This is great for parents that go on the kids are free day. Quarterly Style rule updates are posted on the website. I also added the styles for each quarter for 2017 and the recipe submission page is added as well. In addition to the same judging as last year a popular vote judging will occur in the final month of the quarter meeting. This will need to be done prior to the announcement of the quarterly style winner in order to be fair. So in short all winners will be announced at the same time. This means 4 12oz or 2 22oz bottles will be needed for the Quarterly style. Also we will add a popular vote favorite brew prize in the middle month of the quarter, so February, May, August and the exception being October. These will be for your brews you think are great and would like to be up for a vote. They have no style requirements and will not be formally judged. I expect the prize to be a $10 J&M gift card at this point. Ratebeer Best and Gathering - this event has the rarest of rare brews. If you trade in rare beers this is the event for you. Keep your ears open for the tasting events and bring your best with you to share and trade. Former club member Chad Casper has emailed the club about an event his brewery Benoit-Casper is hosting during SFBW. Various homebrew clubs have been invited to brew a batch onsite on 2/19, take it home to ferment and return 5 weeks later with the brew to be judged. If the club wins it gets bragging rights, a trophy and also an event at the brewery where the recipe is scaled up to production size! Brewers would have to bring our equipment to do the brewing onsite. Please let me know if there is interest in this, it could be a fun event to do as a club and family and friends are welcome to attend. There was at least one club member interested but it would be best with multiple people as it's a club event. Marinwood Homebrew Happy Hour Feb 10th 6-9 with local homebrew. Please let me know if you’d like to serve your homebrew and if so what it will be. I intend to bring some homebrewing equipment there to show people what is needed but my system is quite motley. Otherwise please consider attending, there will be free child care for kids as well. 2017 Napa Homebrewers Classic! This great event is coming up soon. Plan to enter some brews, assist in judging or just attending on March 4th. Also upcoming is the World Cup of Beer! Registration opens tomorrow with entries due March 9th. This is another great competition to enter and to help with if you can. 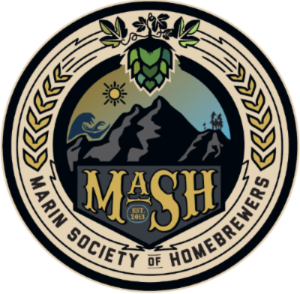 Copyright © 2017 Marin Society of Homebrewers - MaSH, All rights reserved.